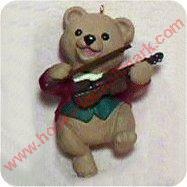 Home > Hallmark Ornaments By Year > 1991 Hallmark Ornaments > 1991 Fiddlin Around - Dancing bear! 1991 Fiddlin Around - Dancing bear! This little fellow does a dance while playing his fiddle.